action against this opportunistic pathogen. bly converting it from fungistatic to fungicidal. Figure 1. Structure of miconazole (1) and polygodial (2). of antibiotics such as actinomycin D and rifampicin . > 1), or antagonistic (X > 4) [9,13,14]. godial and amphotericin B against C. albicans. broth dilution technique at 30˚C [13,18]. 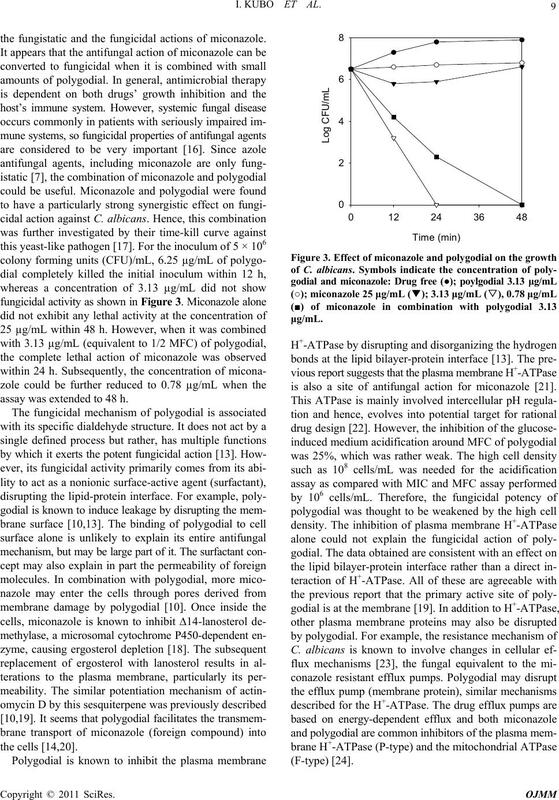 the fungistatic and the fungicidal actions of miconazole. 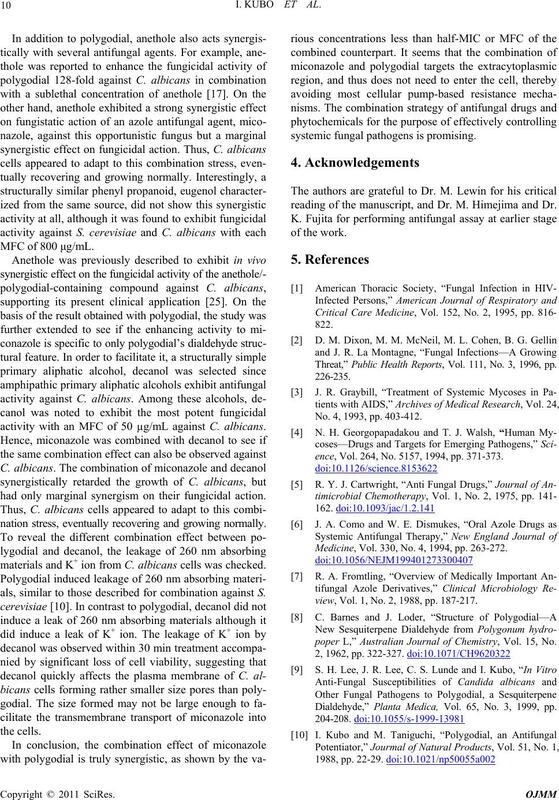 assay was extended to 48 h.
is also a site of antifungal action for miconazole . 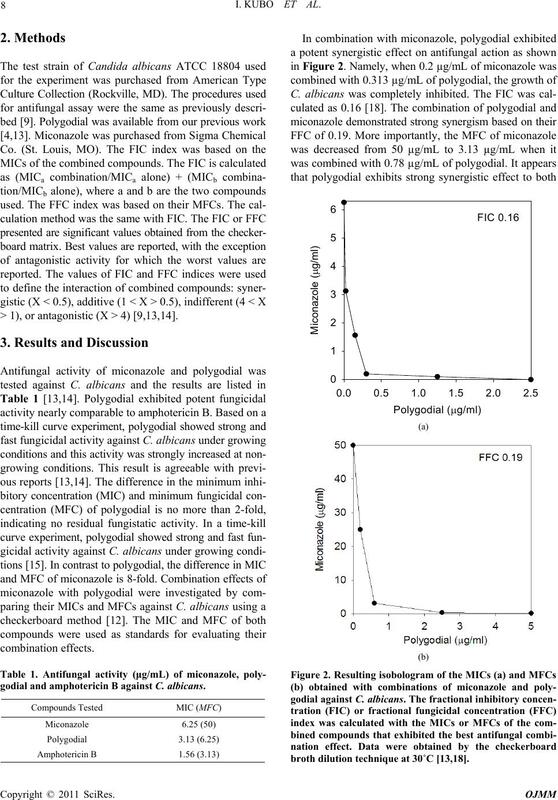 activity with an MFC of 50 µg/mL against C. albicans. had only marginal synergism on their fungicidal action. nation stress, eventually recovering and growing normally. materials and K+ ion from C. albicans cells was checked. als, similar to those described for combination against S.
systemic fungal pathogens is promising. reading of the manuscript, and Dr. M. Himejima and Dr.
Threat,” Public Health Reports, Vol. 111, No. 3, 1996, pp. No. 4, 1993, pp. 403-412.
ence, Vol. 264, No. 5157, 1994, pp. 371-373. Medicine, Vol. 330, No. 4, 1994, pp. 263-272.
view, Vol. 1, No. 2, 1988, pp. 187-217.
poper L,” Australian Journal of Chemistry, Vol. 15, No. Dialdehyde,” Planta Medica, Vol. 65, No. 3, 1999, pp. Vol. 266, No. 5191, 1994, pp. 1632-1634. 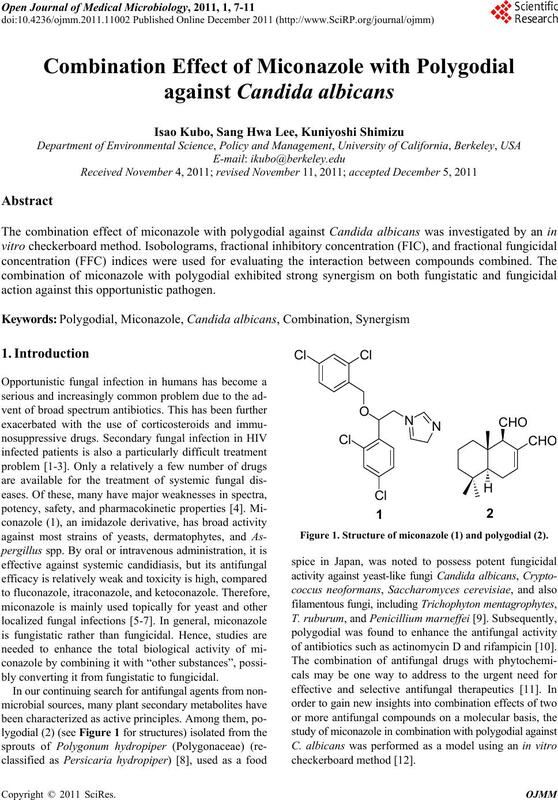 Synergism,” Journal of Infectious Diseases, Vol. 140, No. istry, Vol. 49, No. 3, 2001, pp. 1607-1611. Chemistry, Vol. 46, No. 10, 1998, pp. 4052-4055. Chemistry, Vol. 41, No. 10, 1993, pp. 1776-1779.
cology, Springer-Verlag, New York, 1985, pp. 313-351. Vol. 52, No. 7, 1988, pp. 1881-1883. 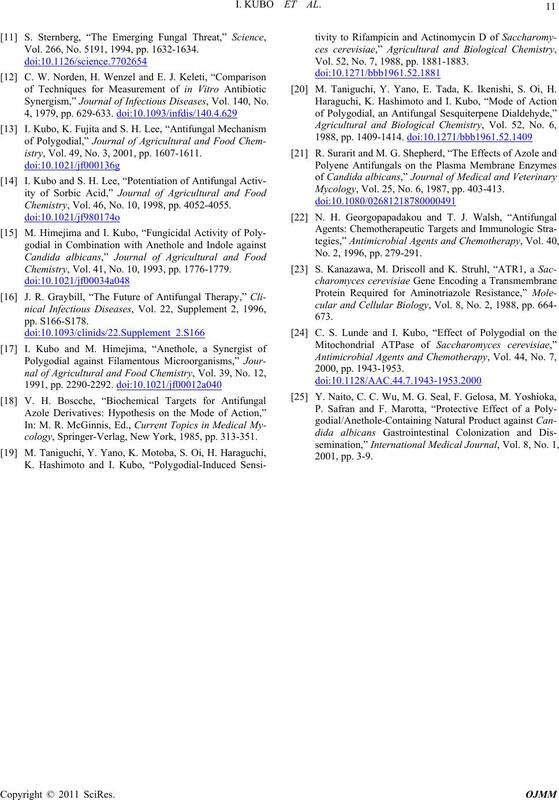 M. Taniguchi, Y. Yano, E. Tada, K. Ikenishi, S. Oi, H.
Mycology, Vol. 25, No. 6, 1987, pp. 403-413. No. 2, 1996, pp. 279-291.